A temporary banner is a sign that is temporarily attached to the wall of a commercial or industrial business unit to advertise events such as a grand opening or sale. 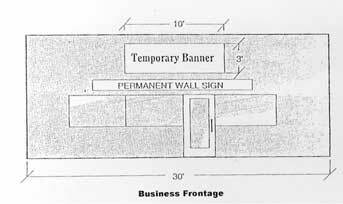 Only one temporary banner per business is permitted. A temporary banner can be on display for up to 30 days within a consecutive 180 day period. A temporary banner must be attached to the building wall. A banner can measure up to one square foot in size for each one lineal foot of business frontage. Complete a Temporary Banner Permit Application form. Frontage of the wall on which the banner will be placed. Submit a Temporary Banner Permit Application with one copy of an elevation plan to the Planning Department prior to installing the proposed banner. There is no fee involved for processing a Temporary Banner Permit application.